There's no such thing as a random act of violence. Not when the New Order is responsible for the violence, anyway. Each gank is meant to impart a lesson--upon the gank recipient and highsec as a whole. Let's see what we can learn from some lessons that took place during the week of October 12th @ 00:00 EVEtime through October 18th @ 23:59 EVEtime. Pay attention to details, my friends. Didli Kugisa lost a fail-fit Retriever. So far, nothing out of the ordinary. Then we look at its value: the Retriever was worth 650 million isk! Another significant note: the gank was performed by Agent Ilithyia Borgia in a 0.9 security system. Imagine being so bot-aspirant as to spend 650 million isk on a mining barge, and to choose to spend one's days mining in a 0.9 system. I noticed Ilithyia Borgia is ganking miners at Maurasi (0.9) / The Forge - this is a change from usual ganker tactics. I am not an expert but I suspect she is using higher grade implants than normal or some other tactic. Maybe someone can shed some light on this. Maybe someone can shed light on this. Agent Ilithyia explained: "What the outlaws don't realize is I don't need 'higher grade implants' or 'other tactics'. I have The Code implanted in every fiber of my being and my only tactic is to enforce enforce enforce." Our man solomon6, the "new player" who was innocently puttering around in a Venture, just trying to learn the game? 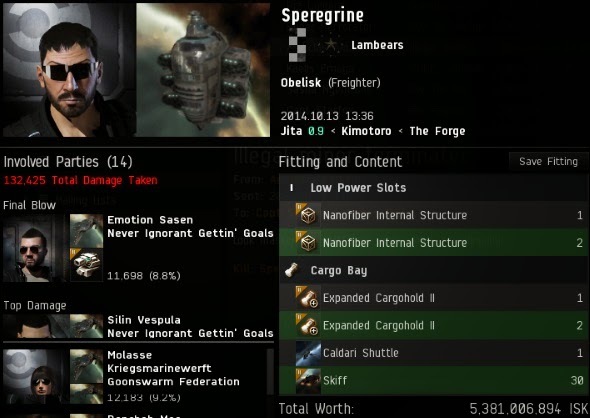 He concealed a pod worth 3.5 billion isk. He would've gotten away with it, too, if not for The Order of Saint James the Divine. No more excuses. Venture pilots must obey the Code, no matter how innocent they try to appear on the surface. The next lesson is about cutting the head off the snake. Speregrine was caught illegally transporting 30 unlicensed Skiffs through Jita. The freighter was the head of the snake, and the permit-less Skiffs were the body. They withered away. Agents Silin Vespula, Molasse, Gad'ui, Alexander Mittani Gianturco, Benchab Mas, Alex Gianturco, Emotion Sasen, Mittani Alexander Gianturco, Turkey Baster, Ikolo, ParticleKnight, Twizzlespark Celes, Amyclas Lacedaemon, and Alexander Sanen were responsible for this kill. Conchita Martinez never gave a second thought to the Code. She thought EVE was about AFK mining in a fail-fit Mackinaw and stuffing one's pod with as many implants as possible. The aptly-named Agent Carebears' Nightmare taught her otherwise; EVE is about the Code and showing respect for my vision for highsec. 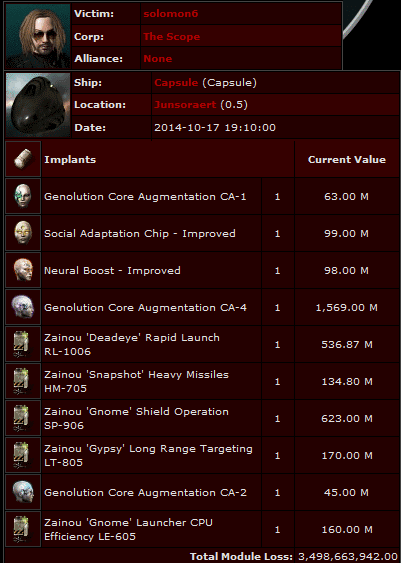 4.8 billion isk worth of implants were destroyed. A teachable moment, indeed! Now for the grand finale. 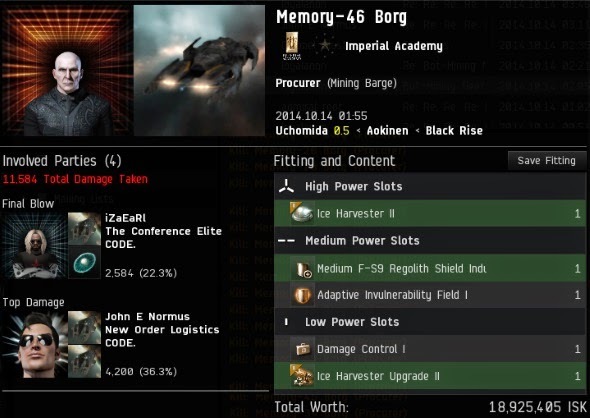 Memory-46 Borg was obviously a bot-aspirant. His name attested to that, even if he was mining in a tanked Procurer. What makes this kill so special? Remember what I said about paying attention to details. Look at the weapon that Agent iZaEaRl was using. It's the icon for a smartbomb. Think about it. Savor it. Oh yes. There's nothing quite like smartbomb Megathrons. The endless nerfs to suicide ganking have made the smartbomb ganker virtually extinct. It takes a truly bot-aspirant mining operation to bring the smartbombers out. The Memory-## Borg gang was brought to our attention when concerned locals notified our Agents. I'm sure the Borg have been petitioned many times, but no action was taken against them. In short, the locals reported the Borg to CCP, and then to the New Order. 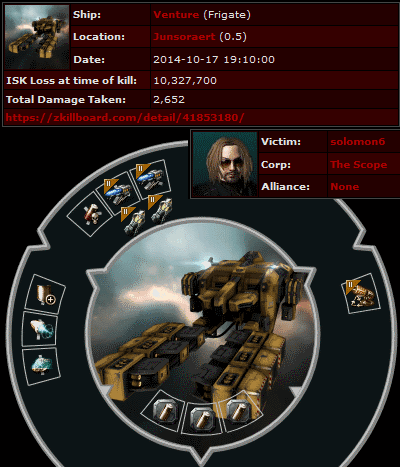 If bot macros aren't detected, CCP considers these reports irrelevant. We don't. 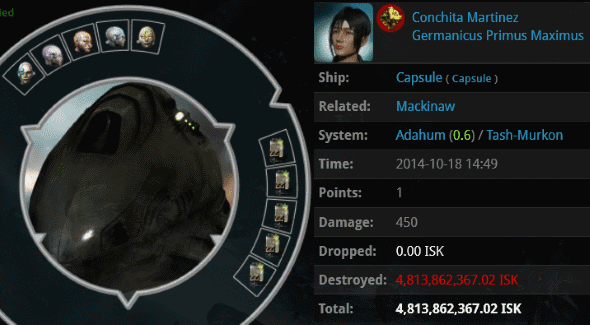 According to the BATTLE SUMMARY, 44 Procurers and 43 pods, totaling more than 4 billion isk, were destroyed. The enforcement was carried out by Agents John E Normus, Mildron Klinker, iZaEaRl, and loyalanon. 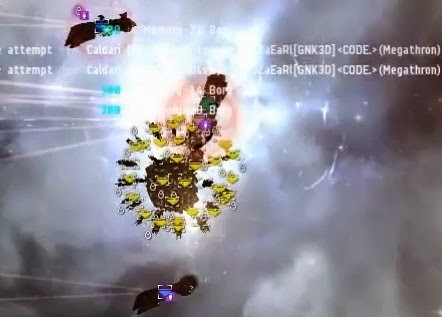 Smartbombing as a gank technique has been nerfed so much over the years that even four battleships with a full rack of named smartbombs, in a 0.5 security system, couldn't bring down all the Procurers, or most of their pods. Not in one attack, that is. So our heroes came back. Forty minutes later. The remaining Procurers--and all the pods--were still sitting there, waiting. Our heroes smartbombed them all again. This time, the rest of the Procurer fleet was wiped out, along with each pod. My friends, there are only two sides in this fight. You can side with the bot-aspirants who make massive fleets of miners and sit in their pods for 40 minutes after they've been attacked. Or you can side with the heroes who bring smartbomb battleships to kill them all. Which side do you think represents the true spirit of EVE? Choose wisely. 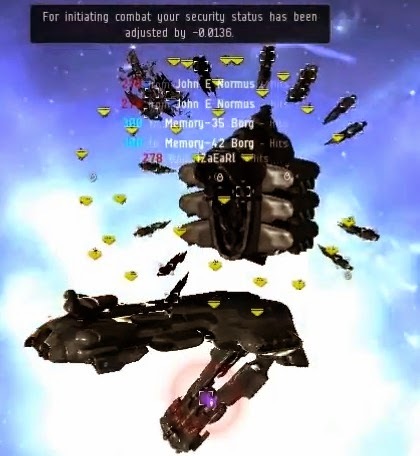 Freighters slaughtered en masse, AFK Retrievers vaporized in 0.9 systems, Procurer fleets going ablaze in a smartbomb inferno... What a time to be alive in highsec! That a truly disgusting amount of botting. Fair play New Order agents stepping up where CCP doesn't have the cojones. Lovely job on the Procurer fleet! Really? 40 minutes? Can we *please* get that botfleet banned? Looking at you, CCP. Sure. Just invite the bots to the Bonus Room channel and have them idle there. They'll get a ban toot sweet. CCP won't ban them because they are paying customers. Because no paying customers have ever been banned. As you can clearly see from the screenshot, CODE. agents are considered as criminals and are not welcome in highsec space. Good thing you will always be too scared to do anything about Code. And as you cans see from the Blog, non-permit holding ventures are considered criminals and are not welcome in New Order space. Stupendous! The whole darned thing, just stupendous! Truly amazing. 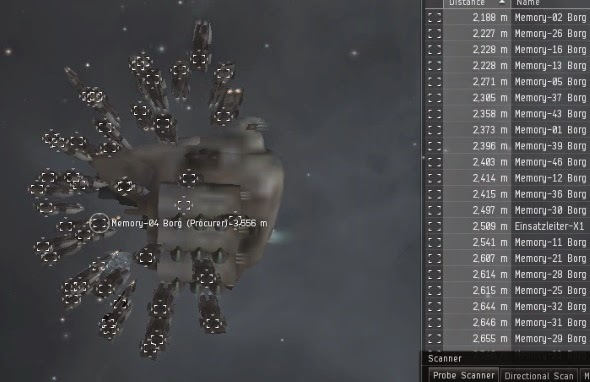 The knights of the New Order protecting HighSec where CCP falls short! Great work! I am proud to say that a man I just recruited into my corporation reported these bots to me; and I passed the word onto loyalanon, who quickly and professionally translated my report from ~words~ to highsec miners learning a valuable lesson. My most profound thanks to the great work of James 315 and the fantastic agents who acted so swiftly on the intel I was able to provide. 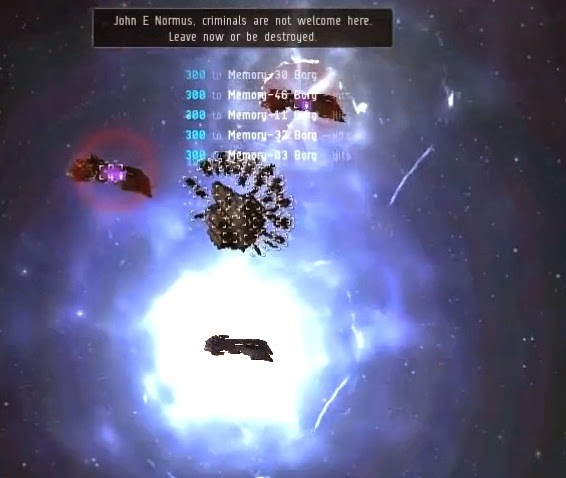 I am surprised, you actually killed a real botfleet. Serious congrats from a guy that seriously despites code for their humiliation techniques. Since it was recommend, i am gonna petition the venture, when the char is fresh and he bought that stuff from plex, thats is a bannable offense. Its about time guyz...slam them some more and i might actually find a way to tell you where you can find more. Also congrats on showing the SBBS is still viable, i figured it was pretty much dead. Last great solo kill i witnessed was around 2012. 1 mega....19 dead macks and pods. lol, i petition whats word petitioning, that means with facts. Petition away carebear. But before you do we should look at Solomon6's killboard (if you can call it that, more like a lossboard). 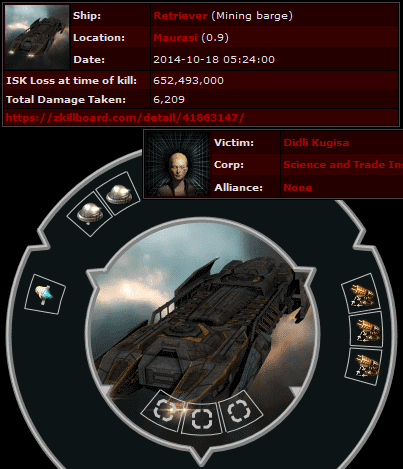 This guys has been loosing ships since 2008, and it wasn't his first run in with the Law of HighSec. Back in February 2013 he lost his Mackinaw to Code agent Buck Futz. Ironically, he had also recently lost his Tengu in a battle with the Goonswarm and the Tactical Narcotics Team. Judging by the fit I would say he was mission running without a permit as well. The funny thing was, I was on patrol with my son when he took out this bot-aspirant. Watched the whole thing go down. The guy actually aligned with and targeted Master42 as he approached for the kill. He was employing the infamous Carebear Stare! Luckily as missionaries of the Savior of HighSec, we are immune to the stares effects. Petition away carebear. It's ALL you can do to fight back. i petition, when its worth something. But i play very occasional. I just do not want to spent more time on hunting you down. but I choose to do nothing. Loyal's stupid music makes that video unwatchable. Such a shame. even the carebears applaud the destruction of this bot fleet. Clearly the CODE is winning hearts and minds. no for the griefing part and the sanctification of erotica1s actions, you are still deeply dispised. You are just doing what you say what you would do and thats seldom. at least you really hunt some botter down. Countdown clock to the imminent Loyalanon ban? You know with his rage issues and his "bonus room" style com sessions the banhammer ain't far off. So Veers you going after Loyalanon next? What part will you be playing in this drama? The same part I play every night, Pinkie. I will be sitting back, eating popcorn, and waiting for the CCP Falcon Punch knockout. the same thing we do every night pinkie Try to take over the WORLD. Seeing that long list of Borg Exhumer kills was an absolute treat. You have wonder: what kind of bizarre human specimen would multibox 30+ miner accounts? These are the deep mysteries we seek answers to at the New Order Department of Space Psychology. Thank you CODE knights for crushing this disgusting display of botness.